This listing is for a quilt pattern, but if you would like us to custom make it for you, just let us know. We will be happy to make it for you! This pattern is a zip file comprised of a 41 page PDF file which is available for instant download once your order is completed and payment submitted. 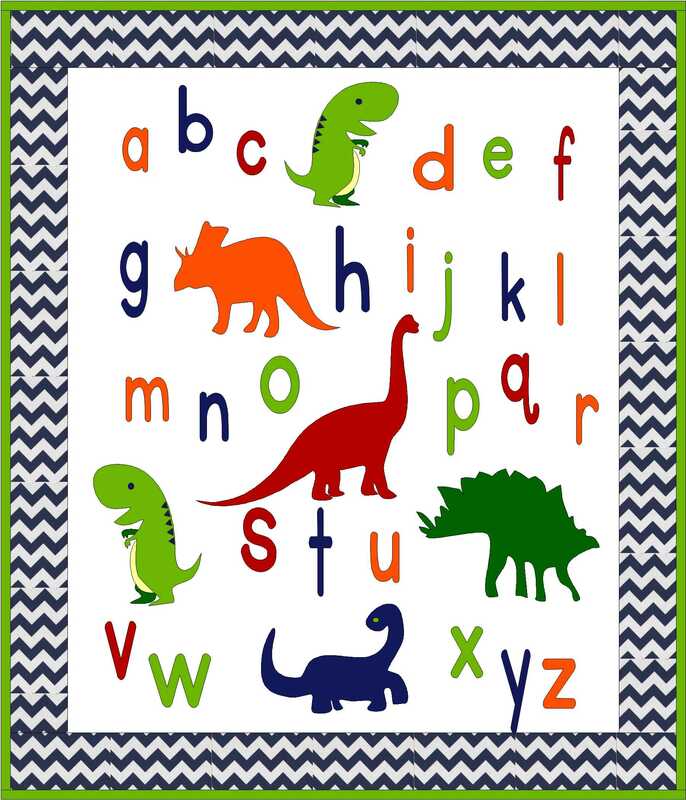 The pattern has templates for 6 separate dinosaurs and cutting files for the dinosaurs and the letters. 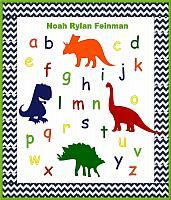 The pattern includes PDF templates to print "at actual size" for hand-cutting letters and dinosaurs. We have also included Silhouette files, Brother Scan-n-Cut FCM files, and standard SVG files which can be used in multiple cutting programs if you prefer to use one of those. The letters are in SVG and pdf formats only. The SVG files can be used in Silhouette, Cricut, Sure Cuts a Lot, and Make the Cut software as well. The pdf files for letters can be used to scan into the Brother Scan-n-Cut. This makes quick cutting of the 26 letters and 6 dinosaurs in whatever format you need. 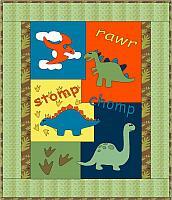 This pattern makes an absolutely darling baby quilt featuring your choice of 4 or 6 dinosaurs on the center block. The finished quilt measures 36" x 42" and is easy to personalize. 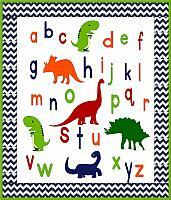 The pattern contains a fabric yardage chart as well as all the templates all the letters and the 6 dinosaurs. With the fabrics/colors shown, this quilt is perfect for a baby boy or girl and would make a wonderful baby gift. It can be enlarged by just making the white center panel larger. The letters and dinosaurs are machine raw edge appliqué. If you need the templates to be in hand-turn appliqué, please contact us before purchase and we will be glad to help. We rate this pattern as Beginner and believe you will find it very easy to put together. There are no refunds on digital downloads for patterns, and we are happy to help in any way. If you have any questions at all, please feel free to contact us.